Jay Bryngelson, our Board President recently reflected on our Women Build week and wanted to share his reflections with us to help us celebrate National Home Ownership Month. Thanks Jay! In this divisive political season, there are powerful moments that stretch across perceived social, political and faith lines and unite us all. Each day of my service as Waco Habitat for Humanity board president, I see first-hand how the Habitat mission brings people together to build homes, communities and hope. 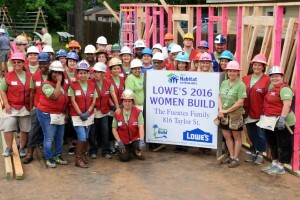 From April 30 – May 9, Waco Habitat celebrated Women Build Week – a competitive award offered to few affiliates across America through a Lowe’s grant. The build marked the 186th Habitat home built in Waco since 1986. UBS Financial was our major local sponsor. Yet, the majority of contributions ($30K) were small gifts honoring moms before Mother’s Day. Support hailed from diverse sectors across the community: Coca Cola, Caritas, Jimmy Johns, Lula Jane’s, Raising Cane’s, Health Care Resort, Texas Road House and 1st Baptist Hewitt served refreshments to 80 plus volunteers. One morning, our heroes from Waco Fire Station 1 brought coffee for all. Katherine Logue (former Habitat Board president) was our energized fearless leader during the build. I am proud of how our community came together in building a home with a single mom and her special needs preschooler; how we did it was even more impressive. More than 50% of our volunteer force was made of ladies: volunteers were from the Women of Waco Club, Lowes and UBS and one outstanding young lady who told us she was homeless. On the last day, we had a mortgage burning: a Habitat tradition that marks the milestone very few American Homeowners reach – the final mortgage payment and the realization of the American Dream. From April 30-May 9, I witnessed a level of unity that Biblical psalmists write about but very few of us witness: the Habitat mission is hard-earned, all are welcome and all leave the job-site positively forever changed. As we launch our blog, it seemed only natural to start with a post about National Homeownership Month. As a staff member at Waco Habitat, most of my conversations tend to revolve around the ideas of homeownership and the importance of being financially stable. National Homeownership Month was made possible by President George W. Bush in 2002. 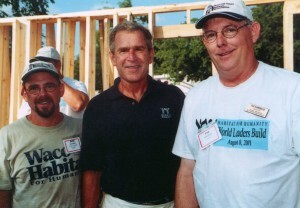 Below is a picture from President Bush’s time just a few months before his proclamation on homeownership. We are thankful for how President Bush recognized the importance of homeownership and decided to make the celebration a month-long event. “Homeownership encourages personal responsibility and the values necessary for strong families,” President Bush said. Homeownership is such an important part of freedom and dignity. Here at Waco Habitat for Humanity, we believe that simple, decent, and affordable housing is possible for every family in Waco, Texas. Are you tired of renting? Are your living conditions below average? Do you want an affordable house to call your own? If you answered yes to at least one these questions, we would love to help you. This month, we encourage people to begin the conversation of why homeownership is something we should all advocate for. Use #homeownershipmonth to continue the conversation with family and friends on social media. We will be posting on Facebook and Instagram throughout the month of June with special attention to homeownership. You can join the conversation by following @wacohabitat on social media.